Ship owners across industry segments have one thing in common – the need for more advanced ships. Naval contractors are looking for smaller, more sophisticated vessels. Commercial cargo ship owners, on the other hand, want to go bigger for increased capacity. Offshore drilling companies require highly specialized vessels, while cruise ship and yacht owners are asking for high-tech vessels and a memorable passenger’s experience. Ships are among the most complicated machines to build, and the demand for increasingly sophisticated vessels has added layers of complexity to the shipbuilding process. As it is, shipbuilders’ operations are already highly complex. Shipbuilders face pricing concerns from ship owners as they look to reduce their total cost of ownership due to regulatory and economic factors. Most contracts – even government ones – now come with fixed budgets and delivery dates. That’s not all. Building ships requires a coordinated effort with globally distributed suppliers. The industry itself is a diverse and complex ecosystem of interconnected owners, shipyards, suppliers, classification agencies and regulatory bodies. This equates to a large amount of people who need to exchange information and work together throughout a vessel’s lifecycle. In the face of all these challenges, shipbuilders are aware of the need to increase efficiency in their operations. However, they are often constrained by manual processes. Until today, many shipyards still get by with the help of Excel spreadsheets as well as lists and 2D drawings. In the past, this approach may have been acceptable, but today’s environment is less forgiving. So how can shipbuilders move forward? Ship owners expect reliable, high-quality vessels that fulfill all of their requirements. In order to confidently deliver these vessels, shipbuilders need to make the right decisions and be efficient at every step. During the design phase of shipbuilding, finding the optimal combination requires the ability to test design options while efficiently managing the associated complexity and risk. Shipbuilders should be able to engineer complex systems efficiently as well as test and validate design options as early as possible in the product lifecycle. It’s especially important to get things right while designing to avoid costly rectifications downstream. So how can shipbuilders achieve ship design excellence? It’s all about having the right capabilities to support this goal. Shipbuilders gain a crucial advantage when they establish continuity in shipbuilding from design to manufacturing. They will then be able to handle design iterations with efficiency – if a change arises, they can quickly understand the impact of the change and efficiently propagate it to manufacturing. The manufacturing stage is where the majority of costs is incurred. These costs come from material, logistics, shipyard facilities, production equipment and labor. Resolving issues earlier during production planning stage will bring costs down significantly. Shipbuilders should therefore identify and address potential manufacturing problems at this stage. As such, the production planning needs to be done early – during contract definition. Apart from ensuring manufacturability, shipbuilders are able to estimate workload and verify the shipyard’s capacity for timely deliveries. Better work preparation also enables shipbuilders to improve the pre-assembly and pre-outfitting processes. This, in turn, reduces the time needed for actual assembly operations. The goals are clear. The solution is just as clear: a full business transformation, supported by the right technology. An integrated digital business platform sets the stage for confident crafting of masterpieces, and our industry experts at Dassault Systèmes know this well. "Shipbuilders need to understand the value of tracing everything back to one accurate source of information, along with linking design and manufacturing processes for end-to-end efficiency." Ready for more? Gain access to more insights from François and our other marine and offshore experts in our latest eBook, To Craft a Masterpiece. 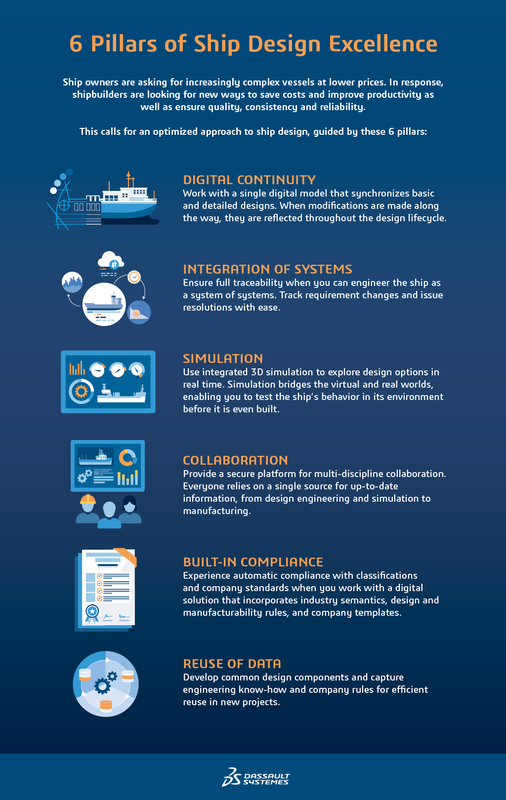 The experts reveal how the modern shipbuilder can manage complexity at every stage of the operations with the help of the 3DEXPERIENCE® platform.